Zamzar is an online conversion web application that gives you the power to better control multimedia and text files you own, and prepare them for use on all your devices and local applications. Interface of Zamzar was specifically made to be intuitive and easy to use. To start converting, you need only to upload a file from your hard drive or to provide weblink to that file, and choose what in format do you want to convert it. Zamzar will take care of the rest, and send you the email with links to your newly converted files. Convert various files online! It supports the most known video formats (AVI, 3GP, MP4, etc. ), image formats (BMP, JPG, PNG, etc. ), sound formats (MP3, OGG, WAV, WMA, etc. ), documents (DOC, XLS, PDF, etc.) and compression (ZIP, RAR, 7Z, etc.). Zamzar will surely fulfill all your converting needs directly from your browser! Converting files is something every computer user does on regular basis, forced to do that because many standalone applications require access to different proprietary formats, some files are well suited for easy distribution over the internet because of their highly compressed data, while some formats are large and retain high quality recording of their data. All of that confusion can sometimes provide a lot of trouble to novice users who don’t know or don’t want to manage a lot of standalone client converter apps on their computer. But solutions for that problem can be found online. Since 2006, Zamzar is one of the largest and most popular online destinations where users can perform more than 1200 file converting operations, enabling them to easily manage their files and receive finished converted files in seconds. 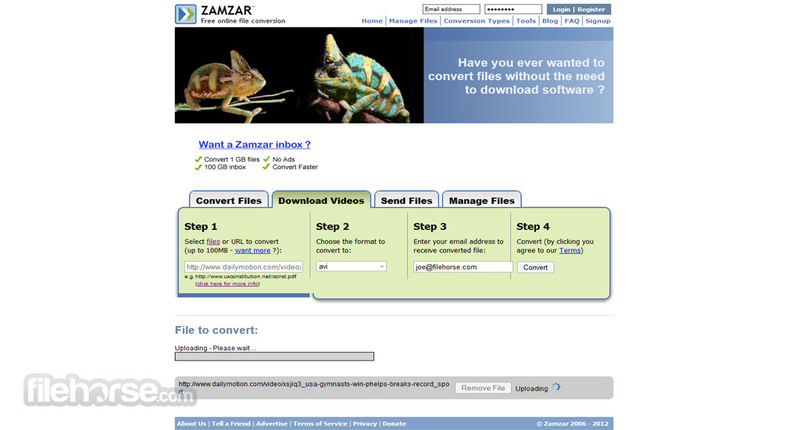 Zamzar is one of the most highly capable online converting tools, enabling anyone from complete novices to seasoned internet users easy access to converting services that are able to convert more than 1200 types of files, which is incredible feat for service that is 100% free and available to be used no matter where youare or what modern internet computing device you are using. Simply load Zamzar’s main page, unload your file, pick a target format, enter you email address and start converting process. And don’t be afraid that Zamzar will not recognize your file, because at the last count it covers truly almost every format, codec or standard ordinary or even professional internet user can encounter in their daily life or work. This includes everything fromvideo formats, music formats, image formats, document formats, ebooks, compressed archives, CAD documents. All those files can be converted to any supported formats, even to some little rare combinations like countless document formats into any image format. Users can also use this service to download files from online hosting websites, although support for download of YouTube video files was stopped in summer of 2012 because of legal reasons. Convert various files online! In addition to conversions that are made on the main page of this site, users also have ability to convert files via email. Simply attach a file of your choice to email message and send it to @zamzar.com email address, with main address being the target format of your conversion (all are supported, PDF, Doc, txt…). 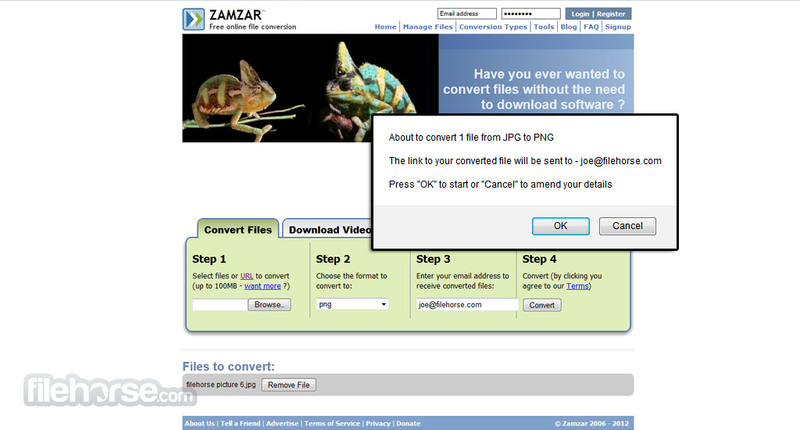 The process of converting files on Zamzar is very easy. Main page of this site hosts simple four step conversion process that anyone can follow. Simply upload your file using site applet (or provide URL to the file), pick any of the offered target formats, enter your email address and you are done. Registered premium members can also access file management dashboard where they can host their online library backed up of files. 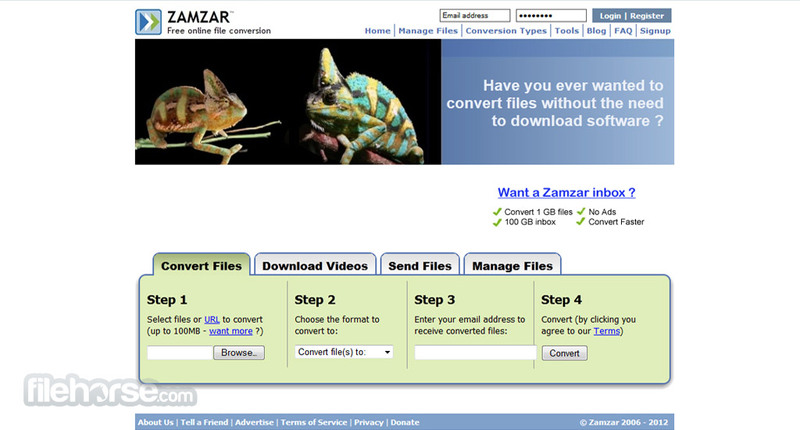 All conversion services of Zamzar can be used anonymously for free, without the need to register. However, premium service is a available, offering 3 tiers of subscriptions ($7-$49) to users who demand more concurrent conversions, larger online storage space, removal of ads, better email conversion service and increase of maximum supported file sizes (up to 2 GB). Convert various files online! Zamzar is a great online file conversion service that anyone can easily use for free, enabling them incredibly fast and streamlined way to transform their files into target format of their choice directly from their browser.